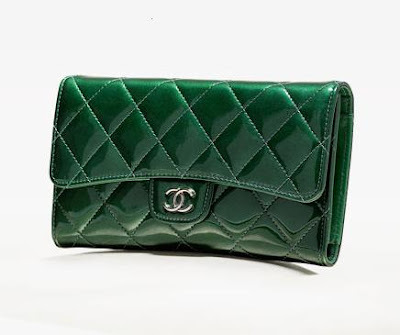 SG does not usually adore green accessories, but if I ever buy a green patent wallet, this will be the one. This wallet has a patch pocket on the back and coin pouch inside, which will be roomy enough for cash, coins, credit cards, receipts, and other miscellaneous membership cards. Also for an evening out, I can use this large wallet as a clutch. How savvy is this idea, two bags for the price of one. SG feels less guilty already! It is not available at the boutique yet but price is about $975 or $995, SA is not 100% positive without looking up the price. Wallet in lamb skin is $930. I like the shade of green..
That really is gorgeous. I'm sure you could find a lot of ways to integrate that into your day and evening looks. i love the color of that wallet. I'm all about a nice bright wallet these days! I'm so happy with my purple Prada. Like the hue. Very deep. I have the same one in black patent leather with a chain. Im actually planning to sell it on ebay!